Today was Mommy's first foray out into the world for something other than a doctor's appointment, with just you and me. We woke up early to go to a moms' group at church. Daddy helped us load into the car. We rolled up into the handicap spot, which was nice, but that's when things got tricky. We settled in to hear a nice talk for mommies, and then POOOOOOOOOP goes the Evie. It was so juicy and loud, that 2 rows of mommies in front of us turned around and smiled. I thought we could sit it out and change you later, but the foul stench coming from you became too much to subject others to. So you, me, the diaper bag, and the 20 lb. 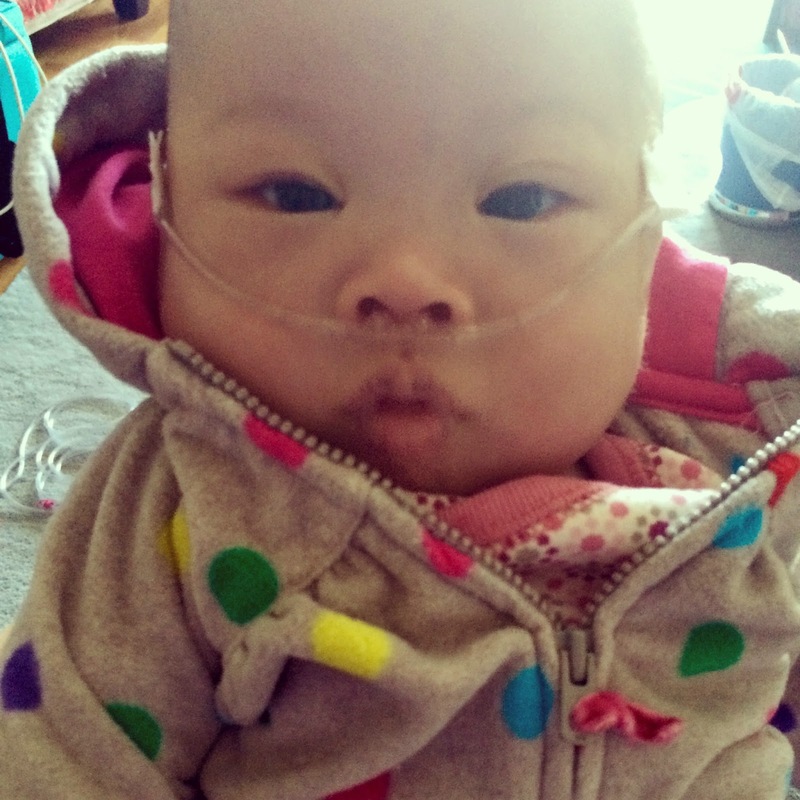 oxygen tank went to find a diaper changing table. IT WENT UP YOUR BACK. We had to change outfits! By the time we finished cleaning up, the talk was almost over! All the mommies then broke up into small groups, and I hooked you up to your G-tube for your morning feed. We were having a nice discussion, and then POOOOOOOOOOOP. Girl, for a tiny thing, you have such loud bodily noises! I decided to let you sit in your carrier and change you later. Getting to the car was even harder, because both the G-tube and the oxygen tank were connected to you. 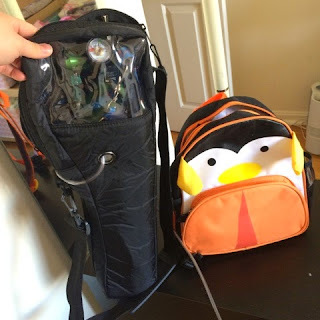 I have decided to call your G-tube penguin bag "Pepe" and your oxygen tank "Ollie," since they travel with you everywhere. I can't wait for the day we say goodbye to Pepe and Ollie, but for now, they are your friends. Another nice mommy helped me carry the diaper bag to the car, so at least I had one less thing to sling over my back. Ollie and Pepe. Pepe is a Skiphop backpack adapted for G-tube use by feediefriends on Etsy. We got home, and thankfully you were sleeping. I got to eat lunch, and then decided to try putting you in the Ergo 360, which is still daunting for me. I got you all nice and snug in the Ergo, convinced you that it was ok, but then you started breathing rapidly. I thought maybe the Ergo was bad for you. Just as I was thinking what to do, POOOOOOOOOOOOP! You christened the nice new Ergo! Thankfully this was just a medium-sized poop that you did while sitting on Mommy. Are you done yet, baby? The day is still young! I can either laugh or cry. I will laugh, because I am thankful that we got to get out a bit, and that you slept nicely through most of everything. At least you didn't spit up too. That would have thrown me over the edge. Now you, Ollie, and Pepe are sleeping, but Mommy can't sleep, because I have to feed you all over again in a few minutes. But you're worth it a million times over. Love you so much, my little girl with the big eyelashes! It is all about the poop! Life is an adventure! I missed you this morning - but the adventure shall continue tomorrow!! ;) Amy, you're doing so great! Look at you!!!!! So proud of you four (Pepe and Ollie, too) for getting out to M2M today!! I think I felt like that after my first outing but without a Pepe and Ollie in tow! Give yourself lots of grace; I'm sure juggling everything smoothly will come soon enough. Even the poop. ;-) So glad you got to mom's group, those are like a lifeline! What's her poo telling you? Love your blog! Amy, I loved this post!